ARRL’s HF Dipole Antennas for Amateur Radio is a collection of 20 HF dipole antenna designs published in QST, ARRL’s membership journal, between 2000 and 2017. It includes innovative antenna projects for single- and multiband antennas, as well as antennas for portable applications. Special bonus section by Jackson R. Richter, WBØUSA, features a thorough discussion about how these popular multiband antennas function. 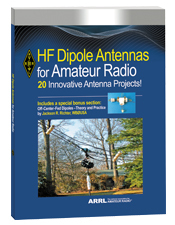 Includes several antenna projects you can build yourself!